Will cutting funds to PA empower Hamas, or force the PA to cut terror spending? Will rehabilitating Gaza improve the security situation? 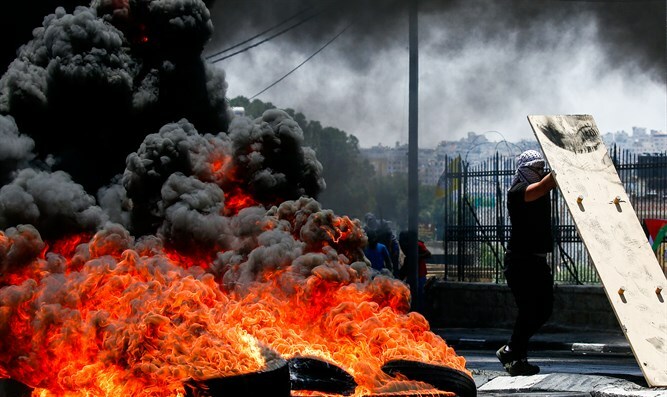 As the situation in southern Israel remains very tense and the so-called Kite Jihad continues unabated, questions arise how to end the stand-off between Hamas and Israel and how to achieve some progress in the renewed efforts to solve the conflict between Israel and the Palestinian Arabs. As Arutz Sheva reported earlier, renowned Middle East experts think the only way to restore calm to southern Israel is to get rid of the Hamas regime in Gaza by launching a large-scale military operation and then start a sort of denazification process similar to what happened in Germany, Austria and Japan after WW II. The international community, including the Trump Administration and parts of Israel’s political and military establishment, however, think solving the humanitarian and economic crisis in Gaza is the key to solving the problem. For this reason the US government has designed a plan to rehabilitate Gaza ahead of the official presentation of Trump’s long awaited proposal for closing the ‘deal of the century’ which aims to reach a final peace agreement between Israel and the Palestinian Arabs. The Gaza plan reportedly envisions the realization of infrastructure, environmental and energy projects as well as the creation of jobs by establishing industrial zones near the border with Egypt and Israel. A port and airport in the Rafah area in Egypt are also part of the plan as is the investment of roughly one billion dollars by Saudi Arabia and Qatar. The plan was rejected out of hand by Palestinian Authority leader Mahmoud Abbas who called it an attempt to divide the Palestinian people and to liquidate the Two-State-Solution. Abbas continues to block any initiative to alleviate the humanitarian and economic crisis due to the internal conflict with Hamas about Palestinian reconciliation and his obsession with his historical legacy as a leader who stood firm against any pressure to make concessions in the so-called peace process. The aging Palestinian leader is reportedly suffering from a potentially terminal illness and is more focused on safeguarding the new-found wealth of his family. The only thing which is really concerning Abbas, whose relations with other PA officials have become increasingly tense recently, is the prospect of a possible coup now that Hamas is again trying to establish itself in Judea and Samaria and has succeeded to win over the support of a growing number of Palestinian Arabs in the so-called West Bank as a result of the ‘Kite Jihad’. For this reason the PA-leader has yet to make good on his threats to end security cooperation with the Israeli Defense Forces in Judea and Samaria. This week, Abbas again reiterated his demand Hamas hand over control of the Gaza Strip as a prerequisite for resuming financial aid to the coastal enclave. The PA leader also met with his former prime minister Salam Fayyad to discuss the possibility of a new Palestinian unity government which would be headed by the former PM, something that will be unacceptable for Hamas and Islamic Jihad. Hamas, meanwhile, is looking for other ways to ensure it will remain in power in Gaza and has already obtained the opening of the Rafah border crossing which was opened by Egypt as gesture during Ramadan and continues to be open for people and imports. Roughly 1,400 trucks with goods have entered Gaza since Egypt decided to open the Rafah crossing but security checks are very limited something that is worrying the Israeli army. Hamas is also looking to bypass the Palestinian Authority by conducting secret talks with Israel a Gaza-based Qatari official told the Chinese news agency Xinhua. The talks are mainly about a deal whereby Israel would help to execute Trump’s rehabilitation plan for Gaza in exchange for the return of Israeli captives and the remains of two Israeli soldiers whose bodies were abducted by Hamas during Operation Protective Edge in 2014. On Thursday Arab media on reported German diplomats are mediating between Hamas and Israel in an attempt to achieve a long term truce which would include parts of Trump’s plan for rehabilitation of Gaza and the release of two Israeli captives and the bodies of slain IDF soldiers Lt. Hadar Goldin and and Sgt. Oron Shaul. At the same time Hamas is paying lip service to the Egyptians who once again try to reach a reconciliation agreement between the Fatah-dominated PA and Hamas. A delegation of Hamas officials left for Cairo this week to discuss the Egyptian plan and reportedly demanded the PA first remove the sanctions slapped on the Gaza Strip last year before direct negotiations between Fatah and Hamas can take place. There are more problems which are preventing any progress in the current drive to find a way out of the impasse which has been in place ever since former Palestinian leader Yasser Arafat launched the so-called Second Intifada, the war which effectively ended the Oslo-peace process. This week Australia announced it would end any direct financial aid to the Palestinian Authority over Abbas’ refusal to end the so-called ‘pay to slay’ policy. Australia became the second country to do so after the United States started the process to the enforce Taylor Force Act, a law which conditioned US aid to the PA on the end of payments to Palestinian terrorists who are serving jail time in Israel and the monthly stipends to families of Palestinian Arabs who died as a result of terrorist activities. In addition, the Knesset passed this week similar legislation which will deduct an estimated $400 million Israel collects in taxes on behalf of the PA since the signing of the Oslo Accords. These measures have the potential of causing the collapse of the Palestinian Authority a number of Israeli politicians and pundits claim. We have heard these claims before, but the fact of the matter is that the PA didn’t collapse when Israel withheld taxes on earlier occasions. The PA is, furthermore, betting on other actors like the European Union to make up for the budgetary shortfall and has already announced it will not give in to the American, Australian and Israeli pressure. "The Palestinian Authority will never stop paying salaries to the families of prisoners and martyrs," PA officials told the Israeli broadcaster Kan. The same officials accused the Netanyahu government of destroying the PA and predicted giant problems for Israel when the government in Jerusalem would have to pay the salaries of civil servants in Gaza and the so-called West Bank after the collapse of the PA. They forgot one thing, however. Under Arafat and Mahmoud Abbas the PA became an extremely corrupt government with the highest number of civil servants and ‘police officers’ per capita in the world while the local population didn’t profit from the world’s highest foreign aid per capita. Withholding funds which were used to pay Palestinian terrorists and their families might not cause a reduction in terrorism, experts think but it won’t lead to the collapse of the Palestinian Authority, which has become one of the world’s most corrupt and ineffective governments since its founding in 1994 as Daniel Polisar already pointed out in 2002.